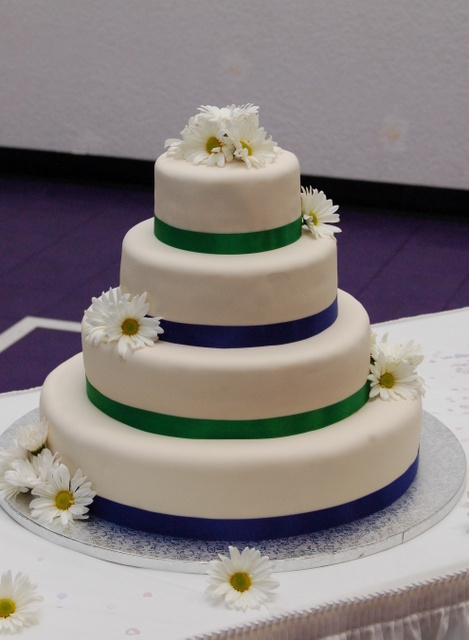 One of the student workers from my previous office was married last weekend, and I had the honor of making the cake! The wedding was at the ocean at Honolulu’s Magic Island at Ala Moana Beach Park. It had been raining most of the morning, but cleared up just in time for the ceremony. 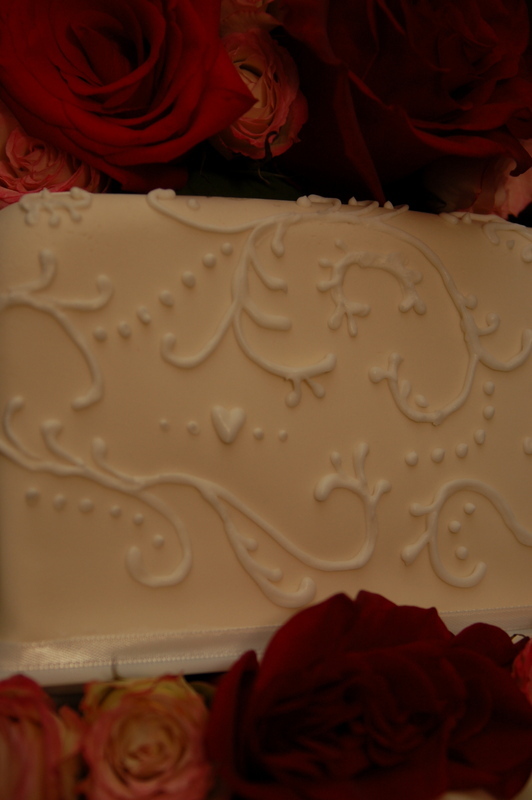 White Satinice fondant with white royal icing piping pearls and hearts. Black monogram topper with dark pink roses. 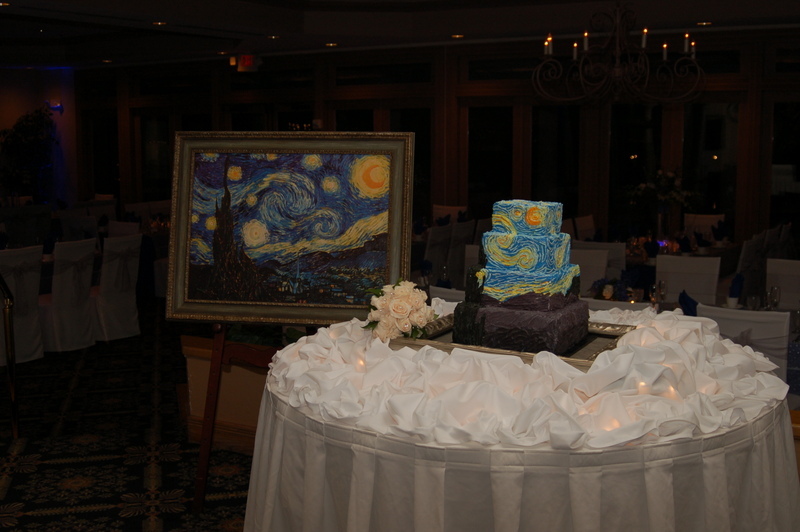 The wedding theme was fashioned after Van Gogh’s Starry Night painting, which I rendered in buttercream impasto on stacked square cake layers. Cake itself was funfetti, in the colors of the painting. 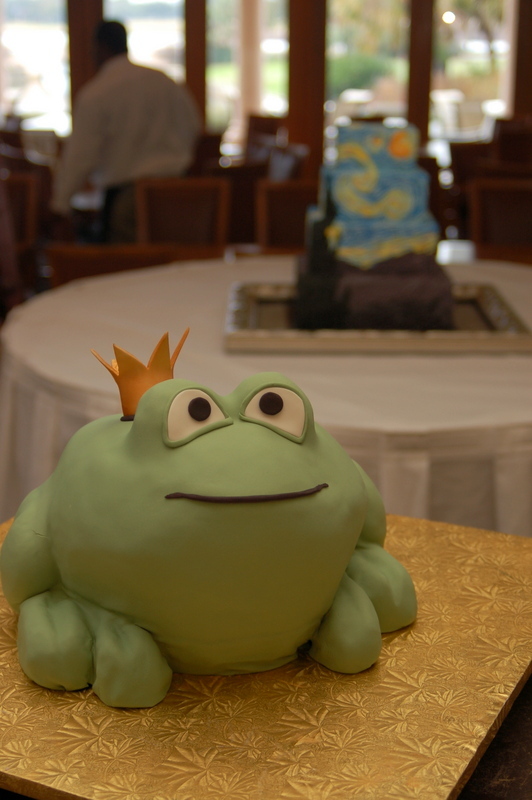 Beth and her mom wanted a frog-prince groom’s cake so she could have a great photo opportunity kissing her Frog Prince. 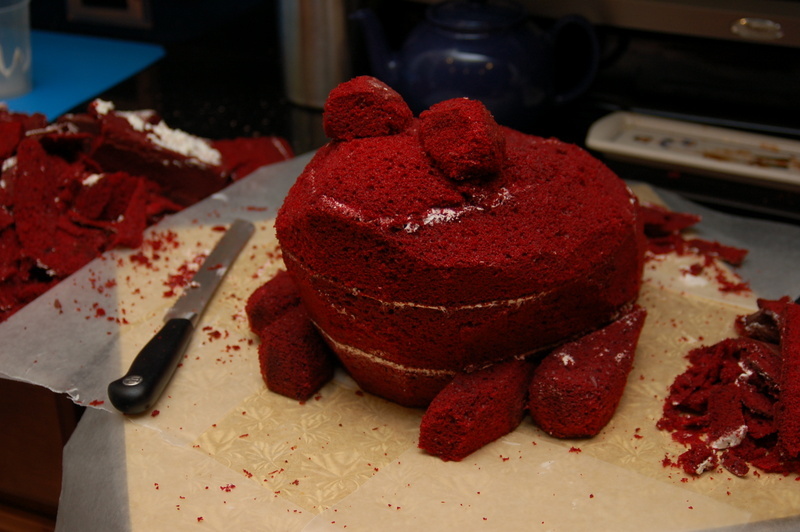 And of course it was red velvet – Steel Magnolias-style. 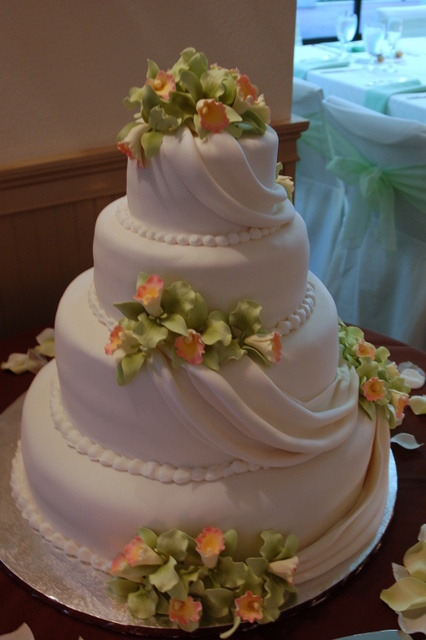 My first sculpted cake. Green fondant, gold lustre-dusted gumpaste crown. 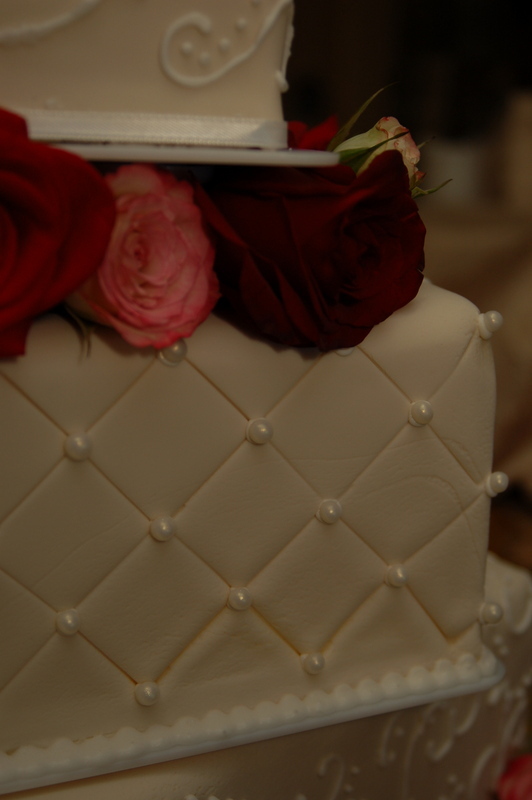 The bride requested an all-buttercream cake – which I don’t typically do in the tropics. 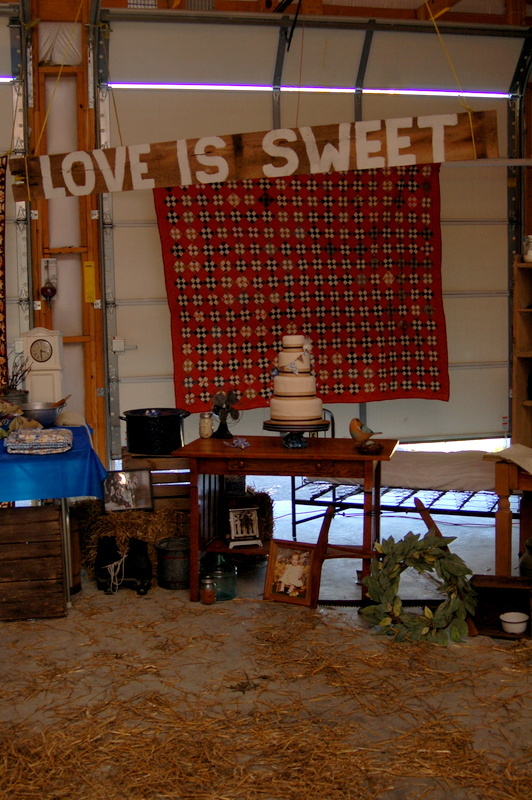 Since it was a small December wedding, I agreed to it. 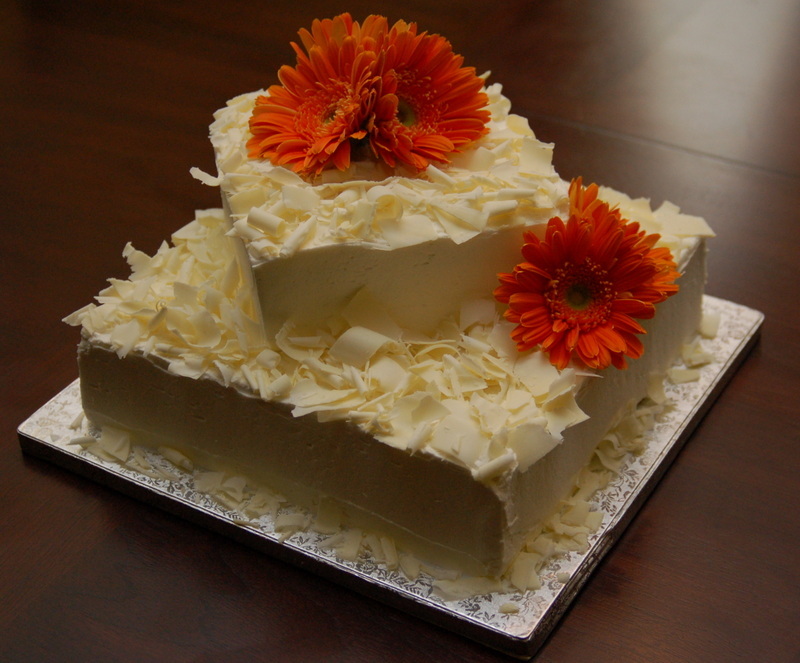 Topped it with white chocolate shavings and orange gerbera daisies. Offset square layers. 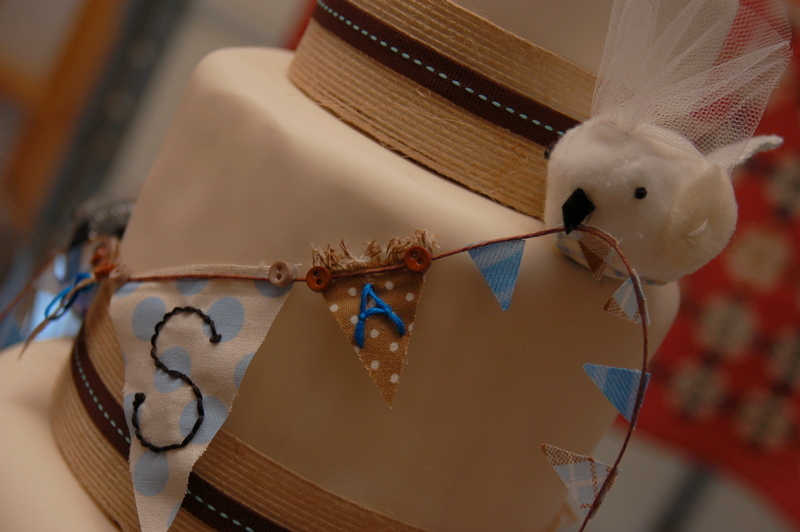 Was given full creative license with this cake, with the only instructions that the couple liked blue and nautical decor. 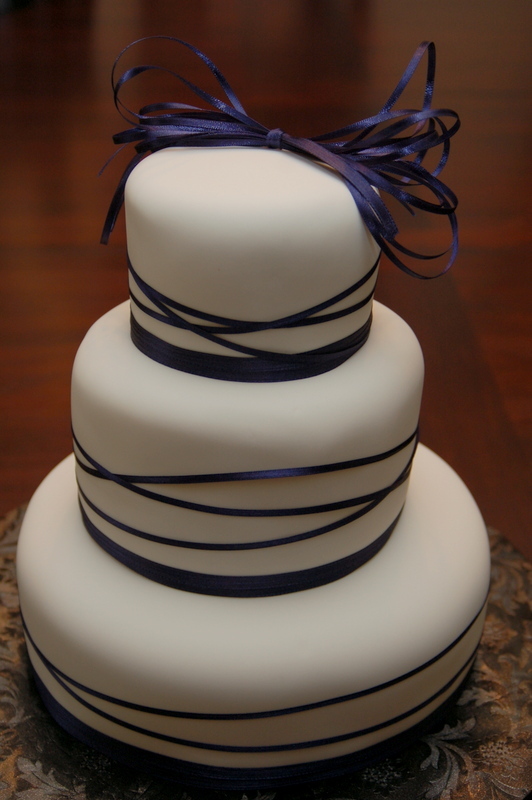 Went understated, like the couple, with navy ribbons that echoed the waves of the sea. 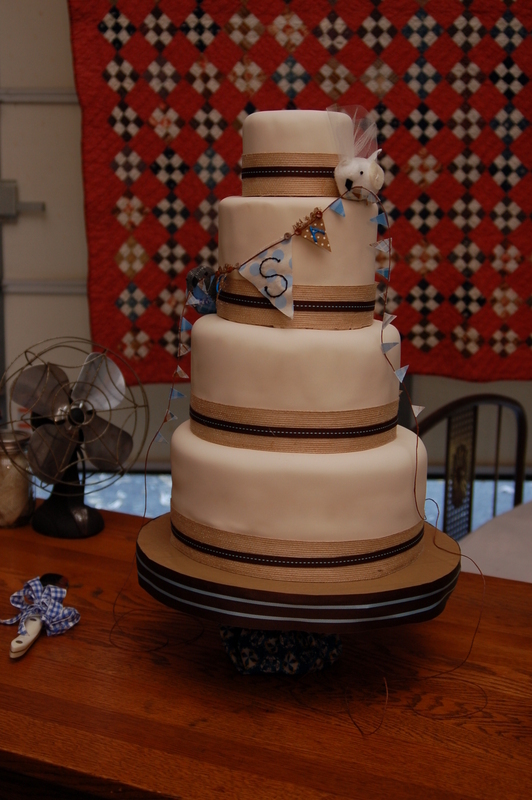 The bride wanted a cake that looked AND tasted like her favorite cookies and candy: Hershey’s Kisses (chocolate cake filled with chocolate ganache), Reese’s PB cups (chocolate cake, peanut-butter buttercream filling), and Oreos (cookies-and-cream cake, vanilla buttercream filling). 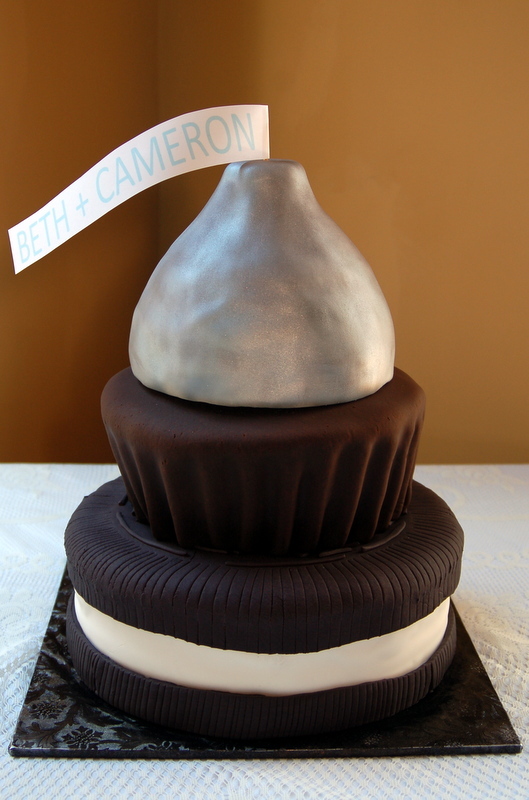 Edible silver spray on top fondant, sculpted to look like a Hershey’s Kiss. chocolate fondant on sculpted peanut-butter-cup cake, and chocolate and vanilla fondant on Oreo-shaped cake. 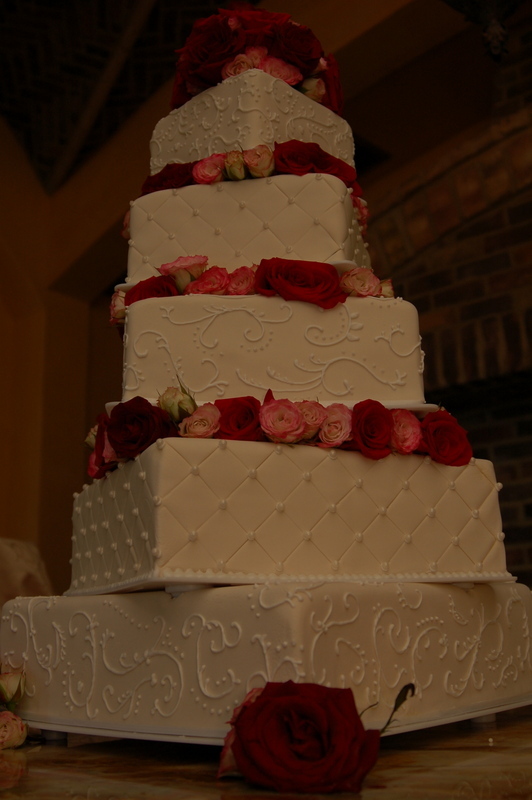 I made Roxi & Zack’s wedding cake a couple months prior in southern California, but none of our other Florida friends could make it to the wedding. 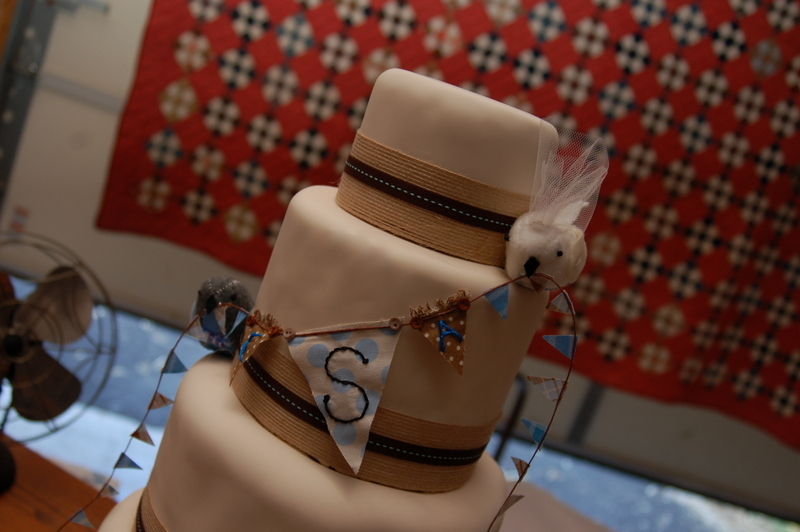 We hosted a surprise reception for them in Florida, and I made this cake, reminiscent of their original cake. 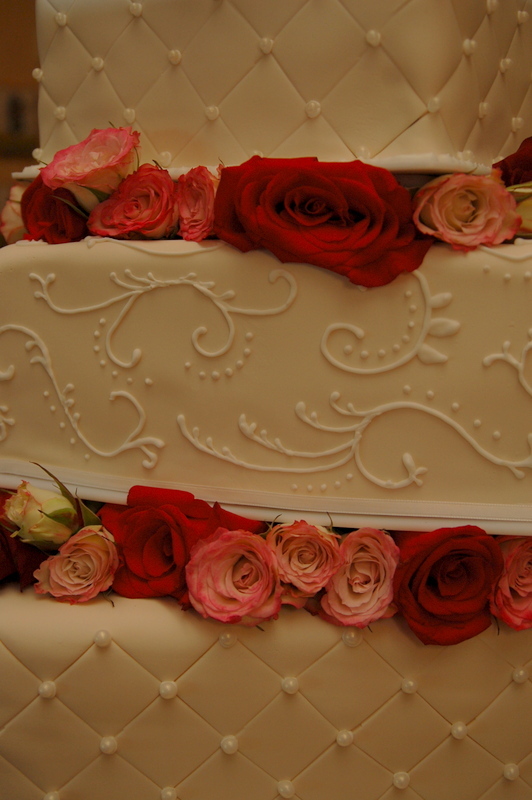 Ivory fondant with royal icing in alternating techniques of filigree and quilting with pearls. 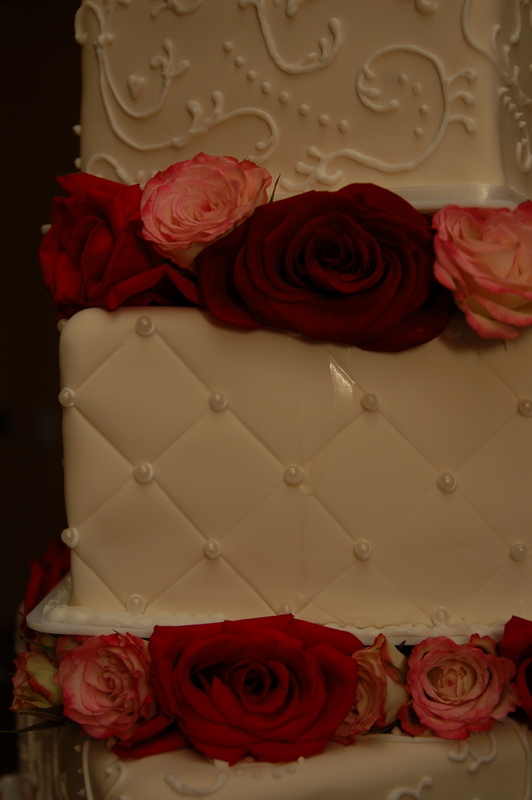 Fresh roses between all but bottom two layers which are directly stacked on one another, per request. 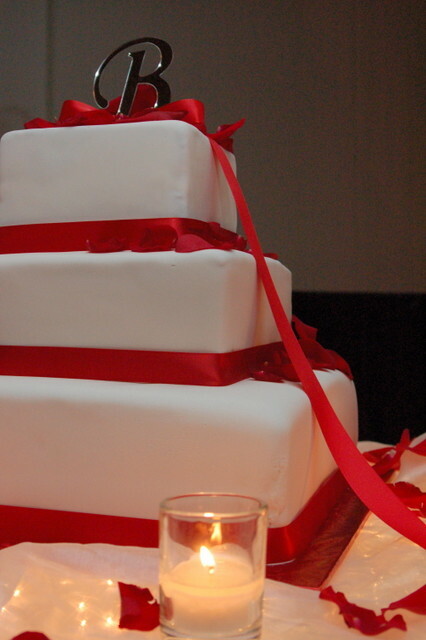 Kristi, an elementary art teacher, asked me to make her wedding cake – her request was to have cupcakes as well as a cake they could cut into. 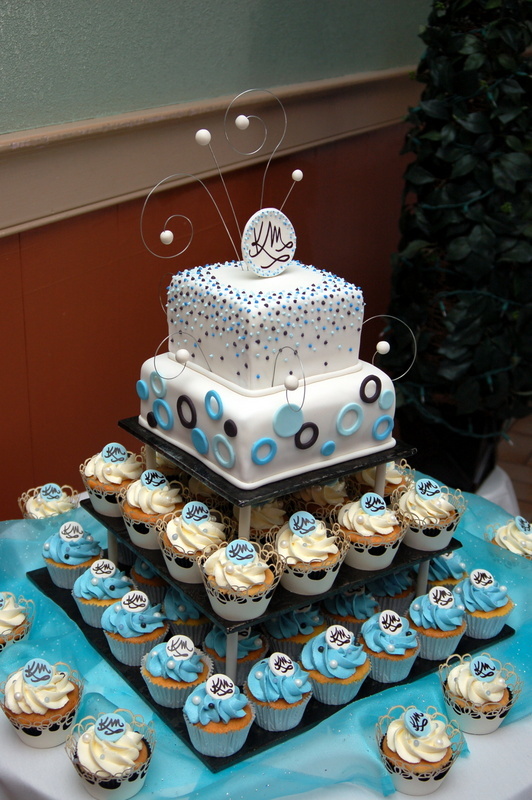 I created this two-tier cake, cupcakes, and custom stand for them. 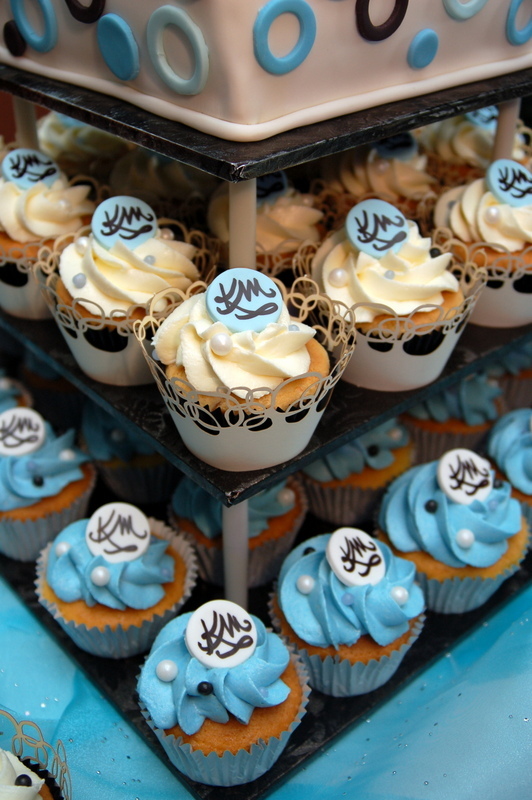 Cupcakes (and cake topper) have a KM monogram on a fondant disc along with sugar pearls coated in lustre dusts. 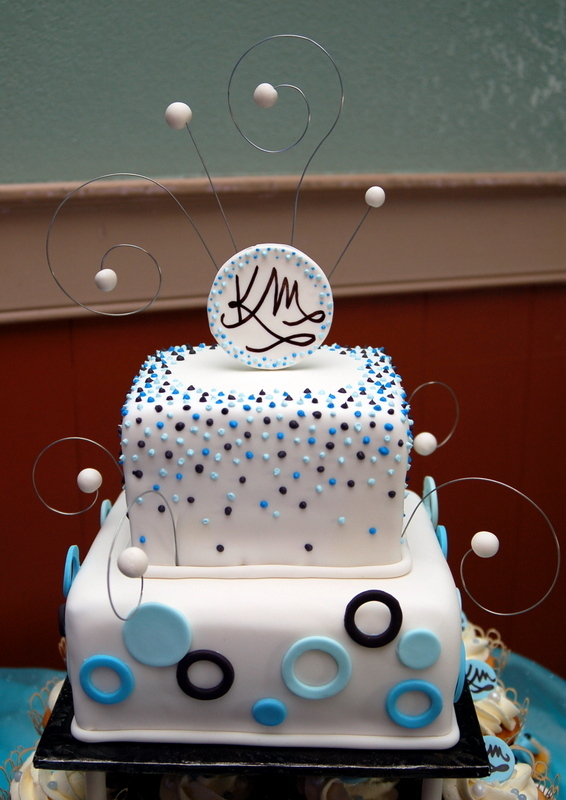 Cake tiers have a variety of decorations, including wired fondant balls, royal icing dots, and fondant circles and rings. 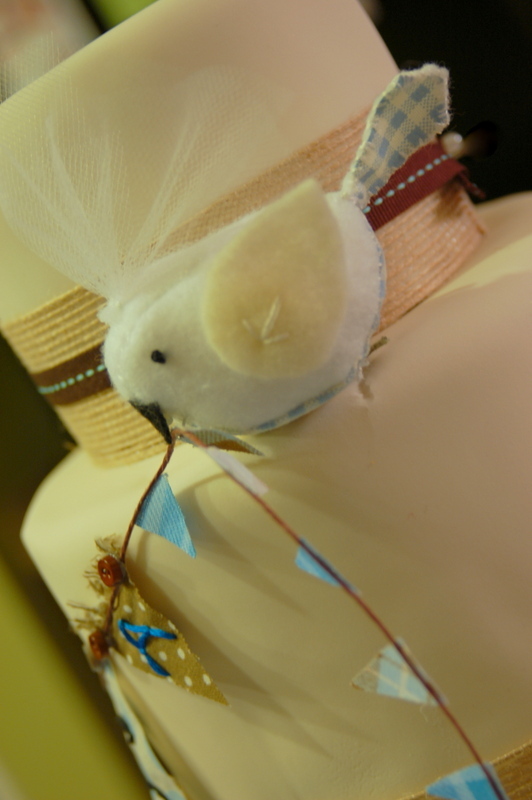 Hand-sewn felt lovebirds and embroidered monogram bunting. 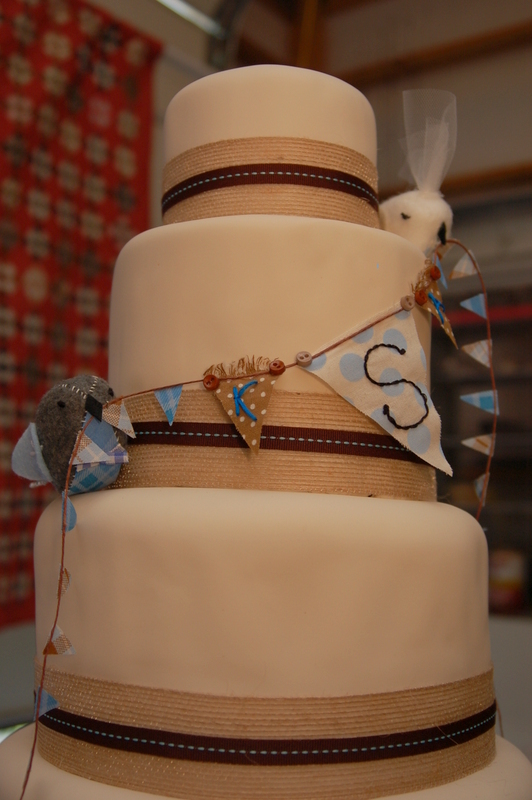 Ivory fondant with burlap ribbon detail. 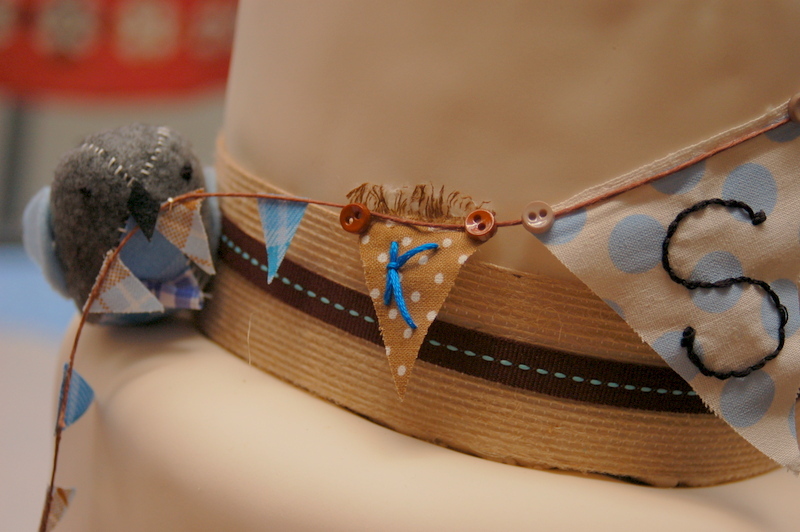 Mixed round and square layers. 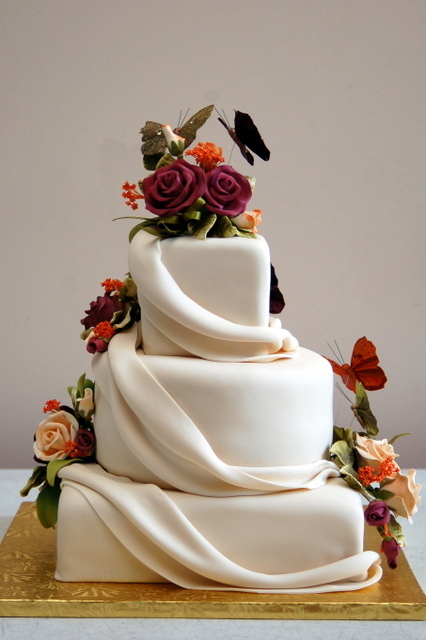 Ivory fondant with fondant draping, gumpaste roses painted orange, maroon, and ivory/blush, and wired sparkly butterflies. 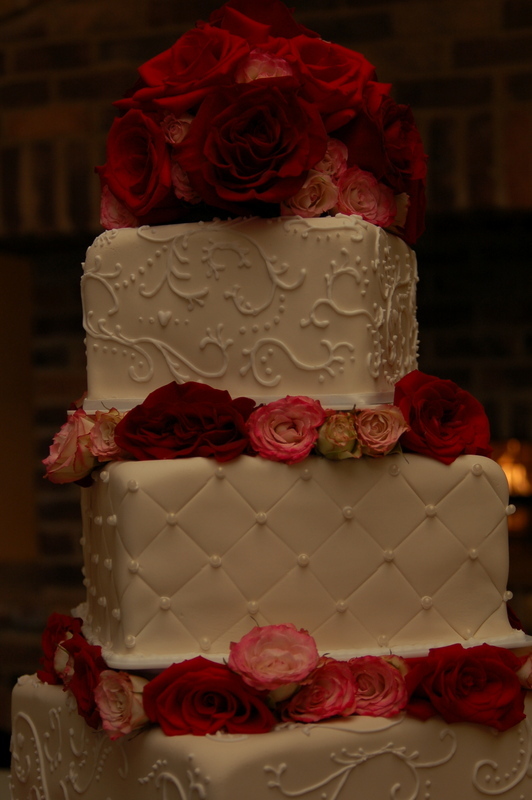 The inspiration for this cake. 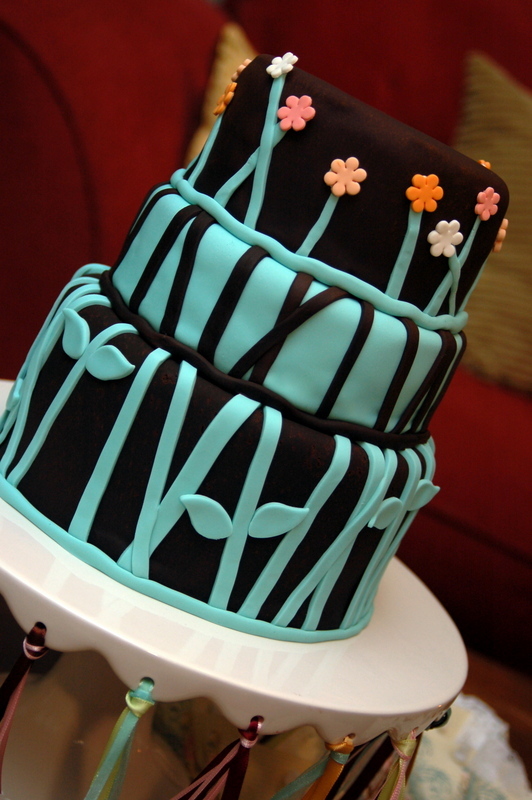 Tiffany-blue fondant with chocolate fondant tree, green gumpaste leaves, pink fondant blossoms. Offset round layers. 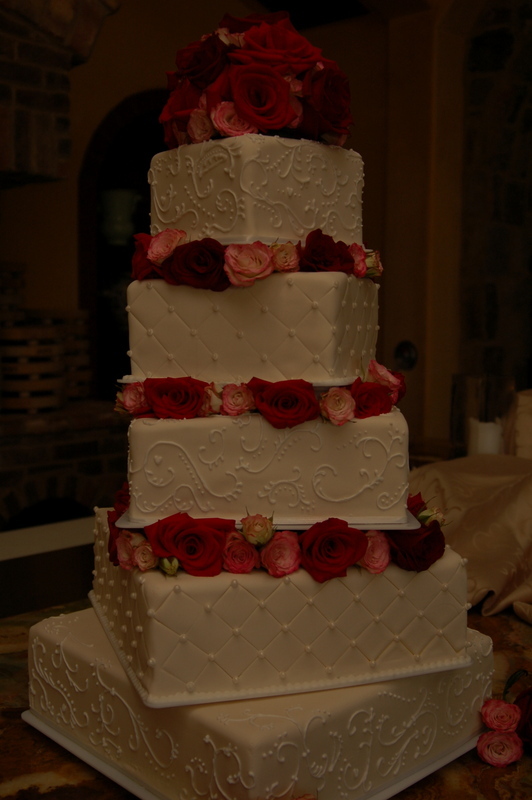 My second wedding cake. White fondant with swags and celery-green-and-pink gumpaste orchids. 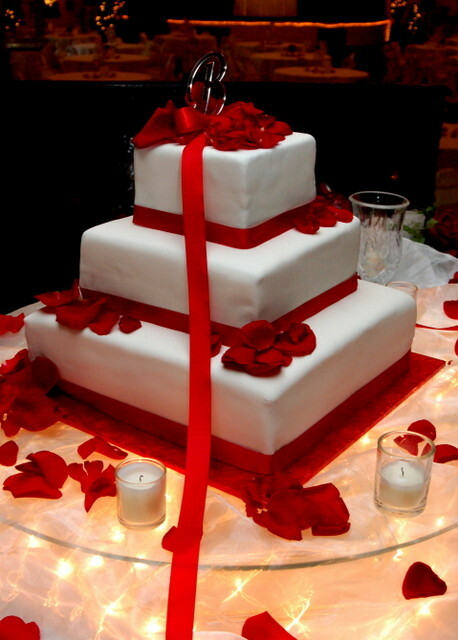 My third wedding cake. 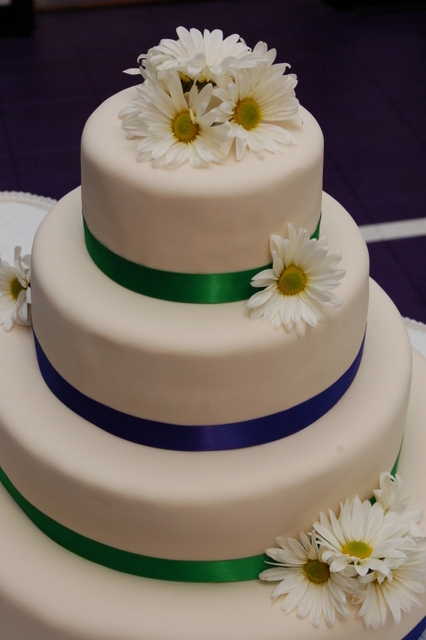 Simple ivory fondant trimmed with blue and green ribbons and adorned with daisies.